The higher oil prices and the subsequent higher oil revenues play a part in a significantly improved outlook for the state finances and trade balances of the Arab Gulf countries, but they are not boosting economic growth, a quarterly Reuters poll of 24 economists showed on Tuesday. The Arab Gulf states have good reason to be happy about their budgets and government accounts this year, as the oil prices have been significantly higher and because they are now boosting their oil production to offset declines in Venezuela and Angola and an anticipated slump in Iran’s oil exports. The Gulf states - Saudi Arabia and its close allies Kuwait and the United Arab Emirates (UAE), for example - are also some of the few OPEC countries theoretically capable of boosting their crude oil production. So far this year, the Brent Crude price has averaged $71.60 a barrel, compared to an average of $55 per barrel last year. Despite the double boon from higher oil prices and rising oil production, the Gulf economies are only modestly growing, and the higher oil revenues will have little impact on that growth, according to the economists polled by Reuters in this quarter’s survey. The governments in the Gulf would rather use the higher oil income to cut budget deficits than to spur economic growth, economists say. The private sector in the Gulf oil-producing countries is still reeling from austerity measures that the governments introduced to try to keep budgets in check after the oil prices slumped. 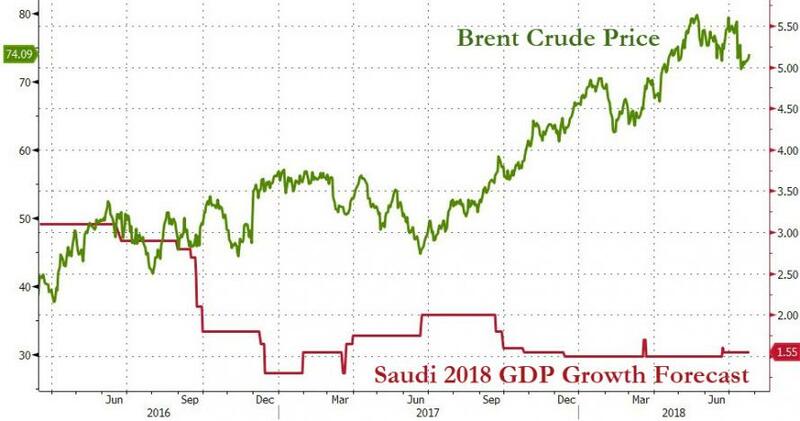 “Higher-than-budgeted oil revenue will not result in higher government expenditure, but rather, it will contribute to lowering the fiscal deficit,” Saudi investment bank Jadwa said about Saudi Arabia. In the previous Reuters quarterly poll, economists were of the same opinion - trade surpluses in the Arab Gulf will increase, but economies will grow only moderately because of the austerity measures.